Dewalt Heavy-Duty 5-3/8 in. 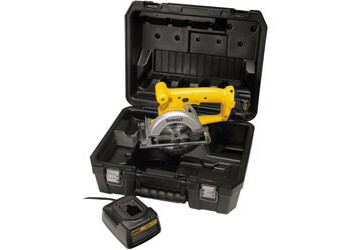 (136mm) 14.4V Cordless Trim Saw Kit. 5-3/8" blade cuts 2X materials (ex. 2x4) on a 90° plane in a single pass. Left side blade provides maximum visibility of cut line. 50° bevel for added capacity. DEWALT built high-performance motor with fan cooling delivers maximum power and durability. 5-3/8" 16-tooth carbide circular saw blade.